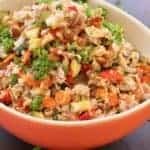 Roasted Vegetable Bulgur Salad | Use the vegetables you have on hand to create a protein- and fiber-filled scrumptious salad! A LiveBest favorite! Soak bulgur: In a quart-sized bowl, stir bulgur and water together. Allow to sit 1 hour as bulgur absorbs water. This can be done a day or 2 ahead of time. Refrigerate after water is absorbed. Vegetables: Heat oven and baking sheet to 425° F. In a large bowl, drizzle vegetables with olive oil. When baking sheet is hot, carefully spread in a single layer. Bake 20-25 minutes until lightly browned and cooked until softened but still have a ‘bite” to them. Set aside to cool. Yogurt Herb Dressing and Salad: While vegetables are roasting, combine yogurt, cumin, oregano, basil, salt, dried chile flakes, and black pepper.Add bulgur, roasted vegetables, raisins, parsley and lemon juice. Stir to blend. Sprinkle walnuts over you before serving. Use the vegetables you have on hand — red cabbage, butternut squash, eggplant, beets, cauliflower, sweet potatoes or broccoli. No raisins? Try cranberries, apples, dates or pomegranate seeds.